What controls the aging process? Is there a genetic component? Or is it strictly entropy: trapped as we are in the vector of inevitable decline as we stumble towards equilibrium. Probably, like the answer to just about everything else, it is neither one nor the other, but an inextricable mix of the two. This is my stock answer at cocktail parties when asked the Inevitable Question (IQ): is it nature or is it nurture? My answer always emerges like some mealy-mouthed prevarication, symptomatic of a failure to take sides. But it’s true. Aging is an inextricable mix of genetics and environment. There is a genetic component. Many of us know families in which longevity appears to be inherited, like a hot temper, or a hitchhiker’s thumb. And nature abounds with closely related species with vastly different lifespans. Maybe what we think of as aging is in fact a complex mechanism that controls the distribution of metabolic resources, yielding a variety of life strategies in response to environmental conditions, a genetic mechanism exposed to the sieve of natural selection. A trait, in other words, that can evolve, or more importantly to us, be manipulated. Aging has experienced something of a renaissance in research these days. I’m about to dump a whole pile of aging data (pun intended) so here is a preamble, for context. Remember – PMID references are obtainable by simply plugging the number into your browser of choice. Mostly, you’ll get at least the abstract. Sometimes, a link to the article as well (depends on the paywall and the funding source). Also another reminder: you may note apparent inconsistencies in gene/protein nomenclature. I try to stick to the accepted nomenclature for different model organisms – it’s a bit confusing. Typically the gene is indicated in italics, and the protein in non-italic text. Sometimes, the protein is capitalized, sometimes not. Go figure. 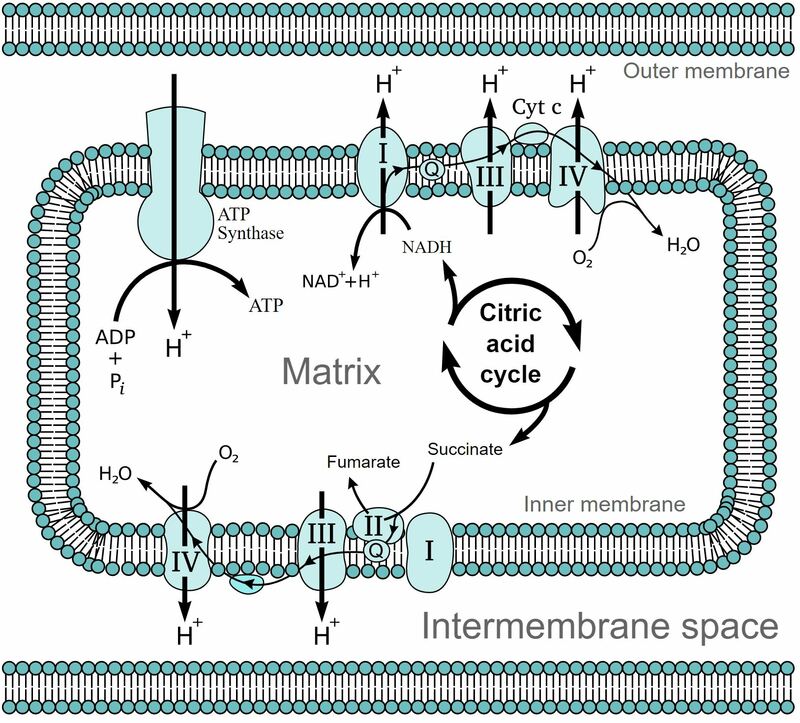 The mitochondrial electron transport chain and its role in oxidative phosphorylation, or, how we get ATP by passing the electrons stripped from glucose to oxygen. Leap ahead here, from 1950’s big puffy skirts and road yachts to 1980’s – big puffy hair and shoulderpads – with a substantial study that investigated the effects of reducing caloric intake in mice. Caloric restriction in aid of lifespan extension is an example of hormesis – a term typically used in toxicology to refer to the potential beneficial effects from low doses of a toxin, but in aging, a reference to the application of some environmental stress that actually improves life and health span. Hormesis in non-scientific circles is rife with quackery – low oxygen chambers, any number of peculiar starvation diets etc. But there is a mechanistic truth underlying the morass of snake oil somewhere, and the 1982 Weindruch study (PMID: 7063854) was among the first to examine this phenomenon in a controlled environment. (OK, the first published study was quite a bit further back in time – published right in the midst of the great depression PMID: 2520283). Weindruch’s group saw a 10-20% increase in mean and maximal lifespan (when compared with controls) in mice fed a diet that promoted “undernutrition without malnutrition.” There also appeared to be inhibition of some kinds of cancer as well. In sum, caloric restriction has been solidly and repeatedly demonstrated as a non-genetic intervention that can extend lifespan, increase resistance to oxidative stress, increase insulin sensitivity and efficiency of glucose metabolism, decrease cholesterol levels, decrease oxygen consumption, lower body temperature and delay the onset of age-related diseases. (PMID: 8658196; PMID: 15619470). Needless to say, finding a molecular genetic explanation for this panacea is tantamount to finding the Holy Grail. A side note: there has been some terminological ping-ponging between caloric restriction and dietary restriction: mostly due to the observation that the age-related effects of food intake is not restricted to calories, but to amino acids as well (particularly methionine PMID: 26663138). I am sticking with caloric restriction for historical reasons – but do be aware that the term is very broadly applied. Still in the 1980’s, and Elizabeth Blackburn and her colleagues have discovered telomerase in the protozoan Tetrahymena (but very quickly found to be pretty much universal). Telomerase is an enzyme that maintains the ends of linear chromosomes (PMID: 3907856). Why is this important? Because the structure of DNA as an antiparallel double helix requires a very complex replication mechanism, where one strand can be copied seamlessly (the leading strand), but the other has to employ a messy leap-frogging kind of process (the lagging strand – the discovery of which is an entirely different and also very interesting story. Also the single most challenging lecture to teach in my intro courses. Second only to photosynthesis). The upshot is that on both sides of a linear chromosome, synthesis of the lagging strand cannot be completed, which means overhanging flapping single stranded DNA on both ends of the newly replicated DNA molecule that nucleases by default chew back (single stranded DNA in a cell is usually symptomatic of Something Bad – perhaps an invading virus, or catastrophic damage). This means that each round of replication will result in shorter and shorter chromosomes, eventually cutting into essential genes that will affect the viability of the organism. And indeed, cellular senescence correlates with shortened telomeres. Telomerase uses an RNA template to add repeats to the ends of chromosomes, thus providing a buffer of additional non-coding sequence that is also folded in interesting ways and complexed with additional proteins – rather like a shoelace protector (an aglet for the crossword enthusiasts among you). But telomerase is not always active – indeed overexpression of telomerase can immortalize cells and make them cancerous, so…good news, bad news, as usual. But shortening telomeres – another mechanistic – molecular – contribution to the aging process (PMID: 9454332; also Blackburn and colleagues were awarded a Nobel for this discovery – more details here). The aptly named nematode worm Caenorhabditis elegans. OK now we are in the 1990’s, and one of the most striking discoveries came out of Cynthia Kenyon’s lab (PMID: 8247153). She and a phalanx of undergraduate students discovered that a mutation in a gene in the nematode worm C. elegans, that normally plays a role in triggering a kind of larval hibernation (called a dauer state) in fact lengthened adult life and health span dramatically – the worms lived roughly twice as long as their wild type counterparts, and did not show any significant impairment in motility or reproductive ability. The gene is called daf-2 (“dauer-formation -2) and the lifespan extending effect requires another gene called daf-16, and importantly, the involvement of both genes suggested that the genetic machinery controlling the arrested growth exhibited in dauers, could also play a role later in development to modulate lifespan. Also, one aspect of dauer formation involved nutrient-sensing: are times tough? Is there low glucose? Time to hibernate: slow down metabolism, hunker down until things improve. And since we are in the 1990’s now, cloning and characterizing genes is red meat for publication. What do these genes, daf-2 and daf-16 encode? An insulin receptor, and a transcription factor. So, a cellular receptor and a nuclear regulator of gene expression: scaffolding for a signaling pathway that involves insulin. Really? Worms have insulin? Well, not quite. Insulin, like everything in evolution, is something of a moving target. The pathway is more correctly called the IIS pathway, or the insulin/insulin-like growth factor pathway – the split moniker arising from the fact that invertebrates, like worms and flies, have a single insulin-like receptor (that binds and responds to insulin-like peptides) while vertebrates like us have multiple receptors and regulatory networks that involve, among other things, the peptide hormone insulin. an accidentally useful model organism because of the (some would say) ludicrous degree of inbreeding to which Fido and his kin have been subjected. (Don’t worry, the research is usually very benign – DNA taken from simple blood tests, some prophylactics that have been extensively tested elsewhere – check out the Dog Aging Project at University of Washington in Seattle). There is even a human model supporting this argument: populations harboring mutations in growth hormone who also show reduced IIS signaling, resistance to a range of age-related diseases, and yes, longer life (PMID: 21325617 – a double edged sword – check out the full range of symptoms that describe this disorder, called Laron syndrome). So while worms (and flies) do not have insulin per se, they do have insulin-like peptides, that bind to an insulin-like receptor (DAF-2) which initiates a pathway that ultimately prevents a transcription factor (DAF-16 – also known as FOXO, which stands for “Forkhead box O” – forkhead is a kind of DNA binding domain) from entering the nucleus. So, increased IIS signaling, less FOXO transcription factor in the nucleus. What does FOXO regulate? A variety of genes, but they have in common the ability to confer a resistance to a variety of stressors, and support somatic (tissue and genome) homeostasis (PMID: 23325358). All this makes sense of the observation that laboratory animals with extended lifespan due to downregulation of this pathway (which remember, means FOXO/daf-16 can now enter the nucleus and regulate its target stress-busting genes) also often show enhanced resistance to stressors like heat (PMID: 1570898). And the same resistance to many of the same stressors can be observed in animals subjected to caloric restriction, so is IIS signaling the holy grail mechanistic explanation for the life-extending effects of caloric restriction? Alas, lifespan extension arising from reduced IIS signaling can be separated from the effects of caloric restriction on life span in a number of different model organisms (PMID: 18221413, PMID: 19956092 flies, PMID: 17081160 worms). So, no, IIS signaling cannot be the whole story. Around the same time the IIS pathway was being excavated in multiple model organisms, a group of researchers led by Leonard Guarante in MIT found that upregulation of a gene called SIR2 in yeast increased lifespan by ~30% (PMID: 10521401). How on earth do you measure longevity in a single-celled organism like yeast? Two ways: chronological cellular aging, or the length of time a yeast cell can survive without dividing (considered a model for how cells age post mitotically, like our adult somatic (body – not germ) cells), and replicative lifespan, or the number of times a mother cell can continue to divide (reviewed in PMID: 28064165). Replicative and chronological lifespan in yeast is increased by caloric restriction, and calorically restricted yeast cells show increased Sir2 activity (PMID: 11000115). This effect has been kind of reproduced in other models – of highest interest, in metazoans where aging cells are not mitotic (PMID: 15734680). But there are contradictory results: PMID: 21938067, PMID: 15328540, PMID: 24036492. I used to be a singer. Hence the posh pic. staggering financial investments in a potential fountain of youth. The most hysterical manifestations come from the usual suspects that manufacture anti-aging creams and cosmetics – presumably rubbing Sirtuin-enriched compounds into your skin can lead to that youthful firm plump supple look. I dare not post any images from the commercial websites describing this garbage, but all you have to do is google “sirtuins and skincare” and have a good larf. Humans have seven versions of Sir2, collectively called Sirtuins, with SIRT1 showing the highest sequence homology to yeast Sir2. Sirt1, 3 and 6 levels are elevated in CR (calorically restricted) animals (PMID: 23661364), but mammals are rather more complex than yeasts – mammals are multicellular, and the Sirtuins all show different patterns of cellular localization and tissue specificity. So does SIRT1 extend mammalian lifespan when upregulated? Well, SIRT1 knockout mice do not show CR-dependent lifespan extension (PMID: 18590691), which argues for a SIRT1 mediated role in CR. But upregulated SIRT1 in mice did not lengthen lifespan (PMID: 20975665) though it did lengthen health span – meaning age related diseases like cancer and diabetes were held at bay. Turns out that the data are equivocal in other organisms too (PMID: 21938067), revealing more or less what we already knew, that aging is a complex trait, highly sensitive to things like genetic background and experimental conditions, most notably, diet. So is Sir2 the mechanistic lynch pin explaining the long established effects of caloric restriction of lifespan? Yes, and no. Yes, Sir2, and particularly Sirtuins in mammals, play a confirmed role in stress resistance, metabolic homeostasis, DNA repair, and so on, clearly extending health span. No, Sirtuins are not the whole story. Maoi -massive statues, possibly representing ancestors, built by the early inhabitants of Easter Island – the Rapa Nui. Photo by Aurbina. By the early 2000’s, it was possible to make a library of yeast mutants, each one defective in a single gene, with an otherwise uniform genetic background. In 2005, Matt Kaeberlein’s lab screened this library for effects on replicative lifespan, and discovered a set of genes that encoded products that functioned in a pathway centered on a protein kinase called TOR, for Target of Rapamycin. What’s rapamycin? A bacterial metabolite isolated from the soil of Easter Island (the inhabitants were called Rapa nui, hence the name). Rapamycin inhibits fungal growth and also arrests cells of the immune system, so functions as a potent immunosuppressive drug (PMID 1700475). And of course, as mentioned, rapamycin also inhibits the eponymous TOR kinase, a highly conserved protein which is truly the control freak’s dream kinase, at the center of multiple pathways that regulate nutrient sensing, growth control, ribosome and mitochondrial function, translation, amino acid uptake and metabolism, autophagy (an intracellular degradation system)…just about everything really. Deletions of genes encoding TOR or other members of the TOR pathway in yeast also extended chronological life span (PMID: 16418483), same for flies (PMID: 15186745) and C. elegans (PMID: 15253933), and reducing TOR expression in mice extends lifespan too (PMID: 23994476). In addition, many studies feeding many different model organisms rapamycin show similar results – extended lifespan (PMID: 16418483 yeast, PMID: 22560223 worms, PMID: 20074526 flies, PMID: 19587680, mouse – importantly lifespan was extended in this mouse study even when the rapamycin was administered to middle-aged mice! Note also, the Dog Project described above includes a Rapamycin trial). So is TOR signaling the pathway through which caloric restriction acts? If so, then calorically restricting animals that are already long lived due to down regulation of the TOR pathway should not lead to further lifespan extension. This is same rationale I’ve already alluded to in previous paragraphs, linking given pathways to each other. The term describing this interaction in linear or parallel biochemical pathways is called epistasis, from the greek: translated as “stopping” or “standing upon.” If CR and TOR signaling are affecting the same pathway, blocking both would be the same as blocking one or the other (since they would be affecting the same thing); there would be no additional lifespan extension. If, on the other hand, CR and TOR signaling were in different pathways, then the effects of inhibiting both would likely be additive – a longer lifespan would be in evidence from feeding rapamycin (which inhibits TOR, remember) to calorically restricted animals. So what happens? Drumroll, please. “Rapamycin extended life span beyond the maximum seen with DR (sic CR) and lessened the reduction in life span with full feeding, suggesting that rapamycin treatment captures some of the mechanisms by which DR extends life span but also acts through additional mechanisms.” (PMID: 20074526). Surprise, surprise. By the mid to late 2000’s, IIS signaling research and TOR signaling research converged to reveal abundant interconnections between these two major pathways – dominated by a set of highly conserved protein kinases. The figure to the left shows a very simplified diagram describing the cross talk between TOR and IIS signaling in a mammalian system – I have put asterisks by the proteins that function in phosphorylation: red for the kinases (adds phosphate groups), blue for the phosphatase (removes them). Note that the TOR kinase functions in two complexes – mTORC1 (this is the nomenclature for the mouse version), which controls the bulk of metabolic responses, and mTORC2, that plays a larger role in cytoskeletal dynamics. IIS and TOR signaling both extend lifespan when down regulated, both respond to nutrients, growth cues, and both control responses to stress. And Sirtuins make an appearance in this network as well. It’s complicated. And somehow, caloric restriction triggers a particular thread in this complex series of interconnected pathways. The race is on for prophylactic mimics of CR. We want to have our cake, eat it, and yet not get fat, not get sick and die. And as usual, everything is disruptive in progress. If you have ideas or business plans or promising findings, click here for $$$$: https://www.mfoundation.org/. So the bottom line is organisms are constantly presented with physiological trade-offs between reproduction and somatic maintenance. Increased reproduction depletes resources, diverting them away from reducing oxidative damage, managing heat and chemical stress, keeping the error rate in DNA replication low. Decreased reproduction restores those resources, and metabolic plasticity in the face of these constant adjustments is itself an evolutionary strategy. Genetic manipulations of the IIS or TOR pathways, both involved in nutrient sensing, phenocopy this plasticity, and sometimes can even be uncoupled from reproduction (PMID: 18682271). Aging research is a tough row to hoe – model organisms like worms and flies and even mice are very tractable etc but they aren’t humans. And humans are terrible model organisms, they don’t consent to control matings, they don’t fit well in the vials and cages etc. And longevity studies are by definition longitudinal, or, long. So, for humans, fascinating (and appalling) diseases that cause rapid and premature aging provide windows into the many tissue-specific manifestations of pathways that control aging – as they typically result from hits in genes that control cellular proliferation, DNA repair, telomere function, stem cell biology, among others (PMID: 20651707). Likewise, massively parallel high throughput this and that technology (sorry not my forte and the papers are rather dull but yes, massively important) are also shedding light on the genomes of centenarians that are still going and going like the Energizer Bunny. Take a look at this table, which comes from PMID: 21115529, a study that scanned the genomes of centenarians for single nucleotide polymorphisms (SNPs) that segregate with long life: some of these genes should be familiar. IIS pathway components are there (IGFR, FOXO3A); APOE, the high-risk allele for Alzheimer’s is there, hTERT is the human telomerase enzyme, and MCP…well I don’t really know what that is, but apparently it is involved in lipoprotein assembly (PMID: 12518019) which perhaps ties in with APOE and Alzheimer’s. All in all, we started with a blurry but complex picture, zeroed in on a few pathways that rapidly proliferated into a gradually more refined, but yes, still very complex picture. Can the Fountain of Youth be within reach?